Introducing the latest in great patios with the new Classic-Craft® Canvas Collection™ – the first premium, smooth fiberglass patio door to carry the Therma-Tru brand name. The collection is designed with all of the beauty and performance of the Classic-Craft Canvas line with a smooth, paintable surface for ease of adapting to home interior and exterior finishes. The doors feature architecturally correct facets, including wide center panels and rich embossement details that rival high-end custom wood patio doors, as well as heavy-gauge steel patio doors. And they deliver all the benefits of a premium fiberglass patio door system including security, durability and energy efficiency. 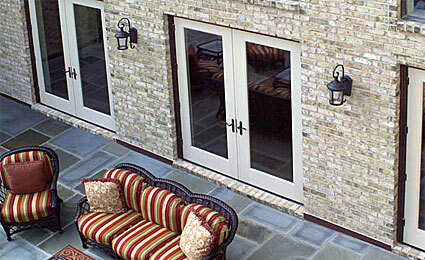 To learn more about decorative glass options, visit ThermaTru official website. To learn more about privacy glass options, visit ThermaTru official website.